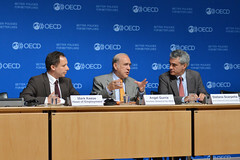 16/07/2013 - Unemployment in OECD countries will remain high through 2014, with young people and the low-skilled hit hardest, according to a new OECD report. The Employment Outlook 2013 says that jobless rates will fall only slightly over the next 18 months, from 8.0% in May 2013 to 7.8% at the end of 2014, leaving around 48 million people out of work in the 34 OECD countries. The report reveals big, widening disparities between countries. Unemployment in the US is projected to fall from 7.6% in May 2013 to below 7% by the end of 2014. In Germany, the unemployment rate will decline from 5.3% to under 5%. But in the rest of Europe, joblessness will remain flat or even rise in many countries. By end 2014, unemployment is expected to be just over 11% in France, around 12.5% in Italy, and close to 28% in Spain and Greece. In many OECD countries, job losses and earnings losses have been concentrated in low-skilled, low-income households more than in those with higher skills and incomes. In the large emerging economies, employment was less affected by the crisis but many workers remain trapped in low-paid, insecure jobs with little social protection. Young people continue to face record unemployment levels in many countries, with rates exceeding 60% in Greece, 52% in South Africa, 55% in Spain and around 40% in Italy and Portugal. People on insecure, short-term contracts, especially youth and the low-skilled, were often the first to be fired as the crisis hit and have since struggled to find a new job. Older workers have fared much better in the crisis, with their job rates rising or falling only modestly. Many are retiring later for a variety of reasons, including better health, the closure of access to early retirement schemes and also financial pressures. New evidence in the Outlook shows that this has not been at the expense of the young. Bringing back early retirement schemes or relaxing rules for disability or unemployment benefits for older workers would be a costly mistake, says the OECD. Governments should tackle the jobs crisis with a combination of macroeconomic policies and structural reforms to strengthen growth and boost job creation. Over the past few years, a number of countries, including Greece, Italy, Mexico Portugal and Spain, have introduced ambitious reforms to reduce the gap in employment protection between workers on temporary contracts and those on permanent contracts. These reforms have the potential, if fully implemented, to promote a more inclusive labour market and a better allocation of resources leading to enhanced productivity performance. A growing number of people, having been unemployed for a long time in the crisis, risk losing their entitlement to unemployment benefits and having to fall back on less generous social assistance. Minimum income benefits may need to be strengthened to support families in hardship, especially where long-term unemployment remains very high. The Outlook also says that activation policies in all OECD and large emerging economies must be strengthened to help and encourage the unemployed and other inactive groups find rewarding and productive jobs. In particular, adequate resources must be devoted to active labour market policies, such as help with job hunting and training, and ensuring that these are sufficiently funded. Spending per jobseeker has fallen sharply since the crisis, by almost 20% on average in the OECD, as pressures on public budgets have risen. Country findings are available for Australia, Canada, France, Germany, Italy, Japan,Korea, Mexico, Spain, the United Kingdom and the United States. Read the latest news release on Harmonised Unemployment Rates for May 2013.